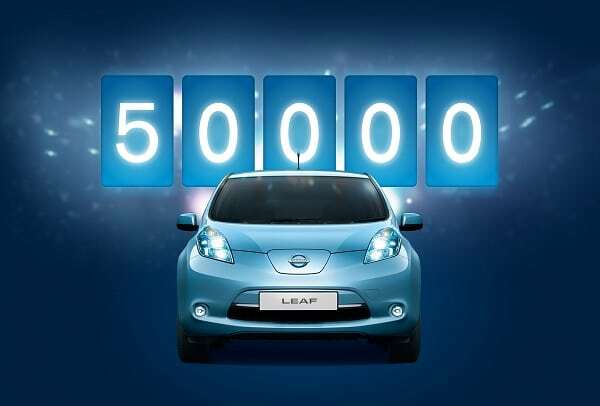 Nissan announced that it has sold over 50,000 Nissan Leaf electric cars since it’s launch back in December of 2010. This makes the Nissan Leaf the best selling electric vehicle of all time, making owners and I am pretty sure Nissan chief executive officer (CEO) Carlos Ghosn happy. This represents an impressive milestone not only for Nissan and the Nissan Leaf electric car but the entire electric vehicle industry as whole. The Nissan Leaf is 100% electric car that starts at reasonable $28,800. Compared to the Chevy Volt which has a small gas engine and the Toyota Prius a hybrid car, the Leaf uses no gas engine at all and is not equipped with one. The Nissan Leaf is equipped with an AC motor that puts out 80 kW of power. (Which I think is pretty good.) The battery is a Nissan-developed laminated lithium-ion battery with an output of more than 90 kW. To recharge to electric motor to 100% it takes roughly 8 hours with a normal charger and just 30 minutes to an 80% charge level using a quick charger under good conditions. Nissan Leaf owners have been happy with the electric ca’s everyday driving performance. Nissan Leafs around the world of have covered a total distance of more than 1.61 million miles, which is a farther distance than going from the earth to the sun. In over 17 European countries currently more than 7,000 Nissan Leaf electric cars are being driven every day. A Nissan Leaf owner in Spain has put more than 26,000 miles on his Nissan Leaf in a year. Impressive but a Japanese Nissan Leaf owner has driven approximately 108,000 miles in his Nissan Leaf. Nissan Leaf owners can now rejoice in the fact that they not only have a 100% electric car, but the best selling electric car globally to date. This sales goal announcement seems to reinforce that Nissan and the world is moving toward electric cars, slowly but surely. Can the 2014 Mercedes-Benz CLA Class attract young buyers?